Villa Viola is a three bedroom detached villa which is situated in the Los Pocillos area of Puerto del Carmen in Lanzarote. The area is popular as it is very flat, so would suit guests with elderly family members or anyone with walking difficulties. 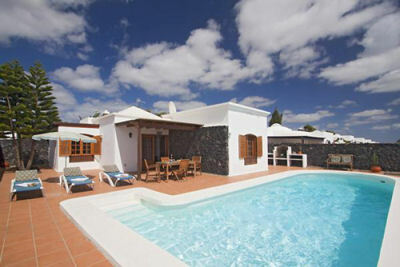 There is a private heated pool surronded by a large sun terrace with sun loungers. There is also a covered terrace with patio table and chairs for dining and a built-in barbeque. The living area well furnished with comfortable sofas and a large satellite TV. There is also a dining table and chairs as well as a fully equipped kitchen complete with island which can be used as a breakfast bar. There are three bedrooms including a double room on the ground floor and 2 twin bedrooms on the lower ground floor, which is accessed via a spiral staircase. The villa has a bathroom on each floor. large double bed, walk-in wardrobe, ceiling fan (lower ground floor). This bedroom is accessed via Bedroom 3.